THANK YOU for supporting the relief efforts in Nepal. Your donation will directly go towards building 1,000 transitional shelters for displaced families. $120 purchases supplies for one shelter. The 7.8 magnitude earthquake that hit areas surrounding Kathmandu on April 25 and subsequent tremors have left hundreds of thousands without homes. 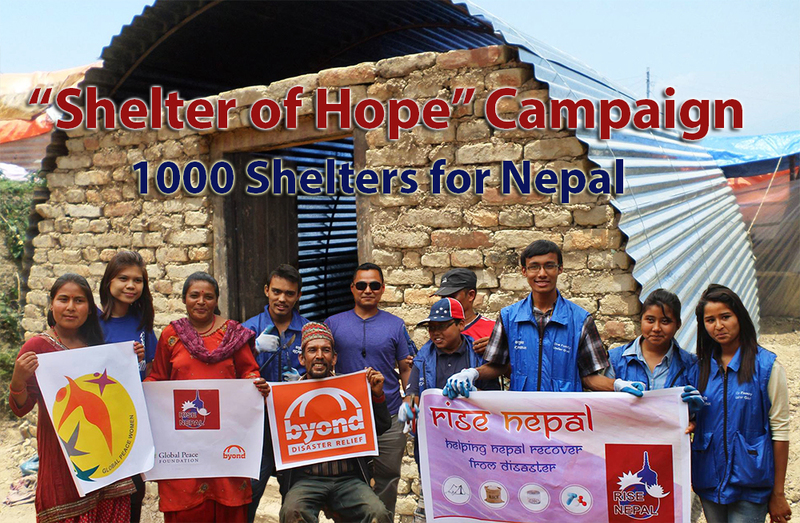 The "Shelter of Hope" campaign, implemented by #RiseNepal volunteers, will provide shelters that will last through the impending monsoon season. Materials can be used later for permanent structures. #RiseNepal is a volunteer effort supported by the Global Peace Foundation and other members of the Asia Pacific Peace and Development Service Alliance. To date over 800 local and international volunteers have been engaged to meet the immediate and long-term needs of earthquke victims.